and reliance makes historical circuits…. truly reliance whas leading nifty by that time. 2)As per Donian chain rule Reliance closed exactly below 4 week. Which is an alarming event. 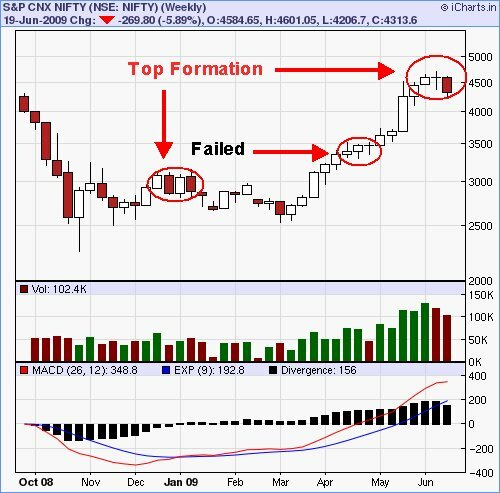 3)Nifty also witness a three week top formation pattern. Short term upside should be used as an exit for the market. 5)Daily Supports comes near 34 EMA(4189). Next level of support comes near 3950 levels. about the downside. Rest everything looks bearish. Yeah that would be suprising. Let see 4460-4480 stands a good level of resistance.